Suncoast Wedding and Event Leaders introduces a one day educational conference on June 13, 2017 in downtown Sarasota at The Francis. The full-pass ticket price includes four education seminars presented by extraordinary professionals from the Wedding and Event Industry. Nick Borelli – Marketing Specialist, Borelli Strategies – With 20 years of experience in the event industry, Mr. Borelli is bringing his successful knowledge of marketing for events and event professionals. 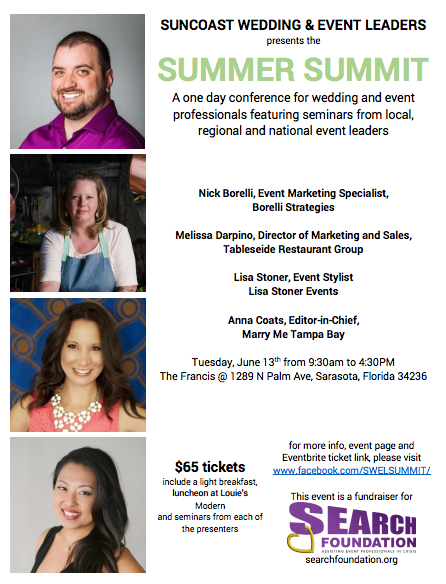 The SWEL Summer Summit will also feature charity luncheon to benefit The Search Foundation, which provides assistance to event professionals in crisis. There will be a light breakfast reception at check-in and a seated luncheon at Louie’s Modern.